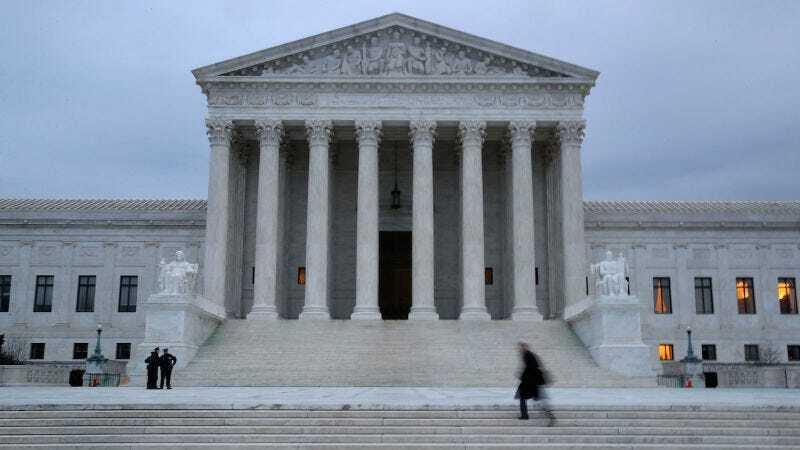 The court, which declined to hear a handful of contentious cases after the death of Antonin Scalia left it shorthanded, returned with a docket that will address legal issues as far-ranging as gerrymandering, workers’ rights, First Amendment freedoms, and Fourth Amendment rights. The court will wade into these complex issues with its newest member, Trump appointee Neil Goursch who is expected to fill the reliably conservative vote of Scalia, leaving four left-leaning justices and five conservative justices (including the so-called “swing vote” of Anthony Kennedy). It’s one of a handful of labor-related cases on the Supreme Court’s docket. In addition to the trio of lined cases, the court will also hear Mark Janus v. American Federation of State, County and Municpal Employees, another labor-related case that could have a major impact on the influence of public sector unions. Nearly four decades ago, the court ruled that public sector unions could effectively require non-union members to pay a fee to cover the costs of collective bargaining (essentially, you pay for the benefits you reap, even if you’re not a union member). That ruling is being questioned in Janus which asserts that the union’s demands violate the First Amendment right of free speech. In another First Amendment case, the court is slated to hear Masterpiece Cake Shop v. Colorado Civil Rights Division. At heart is whether or not Colorado’s law, which prohibts discrimination on the basis sexual orientation, infringed on the religious rights of a baker who was cited for violating that law after refusing to bake a wedding cake for a gay couple. A lower state court found that it did not but the baker maintains that the antidiscrimination law infringes on his First Amendment religious rights. If you haven’t had an anxiety attack yet, the Supreme Court will also hear what is likely to be one of the most important digital privacy cases in decades. In Carpenter v. United States, the court will answer whether or not prosecutors need a warrant to track a persons location through wireless data. The case stems from the conviction of Timothy Carpenter for a series of robberies. Prosecutors used Carpenter’s locations, accessed through wireless records obtained without a warrant, as evidence in his trial. The ACLU contends that prosectors’ actions violated Carpenter’s Fourth Amendment rights. In addition to these landmark cases, the court will also hear cases on the legalization of gambling courtsey of Chris Christie and a case that could determine how long noncitizens can be held without a bail hearing. Initally, the court was also scheduled to hear a challenge to Trump’s travel ban, but that case has been (perhaps temporarily) set aside while the court determines whether or not the president’s revised travel ban has rendered the initial challenge meaningless. It’s going to be an exciting nine months.